I am always a little bit proud (well quite a bit actually) of myself when I cook something without a recipe. I mean: when I actually invent a recipe. Of course I often cook without a recipe, but that’s because I know the recipe by heart. Very seldomly do i actually cook something that I invented myself. Today I made white beans with chorizo. And I may not be the first or the only one who ever made this. But I created this recipe myself, and I have to say, it’s good. And it’s a quick dish too. Takes about 20 minutes all in all. So here goes, and I am not good with planning amounts, so go with whatever you feel like. You’ll need fresh white beans by the way. Fresh white beans taste much better than the dried ones, and are hardly comparable to the stuff from a can. Wash the beans and then cook them in enough salty water, it took a little more than 15 minutes until they were done. In the meanwhile cut the onion and chorizo and garlic and slowly fry it in a little oil (I used olive oil). Then, chop the parsley, cut the spring onions and the tomatoes. Add the tomatoes to the onion and chorizo, but not too long before the white beans are done, cause then you’ll just have tomato sauce and I wanted to have some pieces of tomato. Of course, I you rather have sauce…cook them longer. Try whether the beans are done, and if so, throw away there cooking water and add the beans to the pan with the tomatoes and chorizo. Carefully stir and heat through and through so that all flavors are mixed, and then add the spring onions and parsley and eventually salt and pepper to taste. I also added a good splash of good olive oil at this point. Mix well. Done. You are ready to eat. Enjoy! 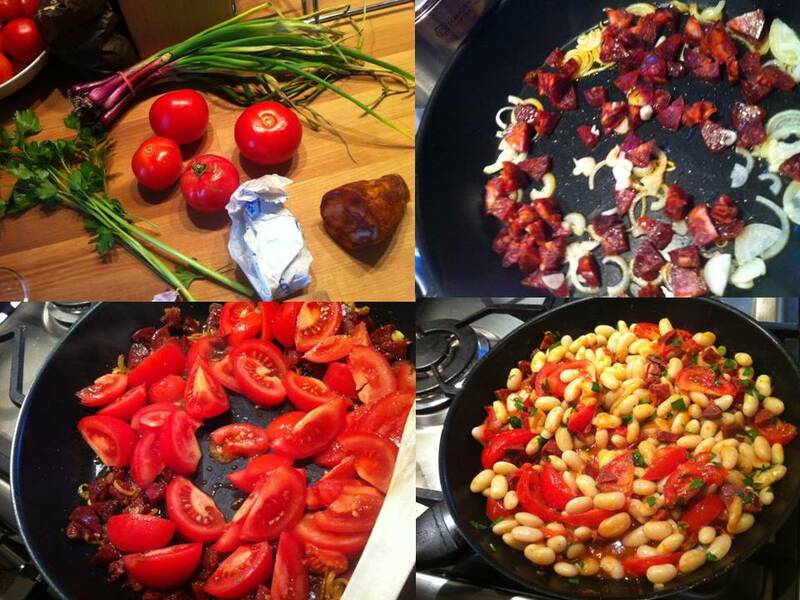 This entry was posted in ate, cooked and tagged chorizo, white beans on October 22, 2013 by esthercooks.